The apartments feature a Queen size bed, ensuite bathroom, air-conditioning on request, private balcony with superb ocean views, full kitchen with large fridge, oven and microwave, iron & ironing board, opening windows, Cable TV and tea & coffee making facilities. The rates are for 2 people with a maximum occupancy is 3 people and the extra person charged @ $25 per night. Some apartments have a fold out divan in the lounge room. One Bedroom Apartment featuring a Double bed and fold out Sofa bed, fully self contained kitchen & laundry, private balcony, TV and direct dial phone. One Bedroom Apartment featuring a Double bed and fold out Sofa bed, fully self contained kitchen & laundry, private balcony, air-conditioning, TV and direct dial phone. Modern and spacious 1 bedroom air conditioned, non smoking apartment featuring 1 Queen Bed or 2 Single Beds in the main bedroom (please specify preference when booking), fully equipped kitchen with full crockery/cutlery, dishwasher, microwave oven and refrigerator, seperate lounge area with colour TV, pay/satellite TV, telephone, rollaway bed (if required), large private balcony with outdoor setting, private bathroom with bath, all linen and blankets, clock, radio, private laundry with washing machine and clothes dryer, hairdryer and iron/ironing board. Rate is for 2 guests. Maximum occupancy is 3 guests. Additional guest charge is $30 per guest aged 3 and over. Children up to 2 stay free in existing bedding. Cots are available at extra charge - $8 per night. Run of House room. Fully self contained apartment with a separate bedroom with a Queen size bed, fully self contained kitchen, separate dining and lounge area, air-conditioning, private laundry facilities and direct dial phones. One bedroom, fully self contained apartment which looks towards the tropical gardens and heated swimming pool of the resort with views of Surfers Paradise. The apartment comprises 1 Queen size bed in the bedroom, private bathroom, fully equipped kitchen & laundry, lounge with double pull out sofa for additional guests, ceiling fans, private sunny balcony, cable TV and CD player. Room rates are for 2 persons. Maximum 4 guests. Extra guest charge $30 per guest per night. Children under 2 years in own cot are free. Cot & linen available for hire. Air conditioned rooms available - $10 per night surcharge applies. 1 bedroom apartment complete with a fully equipped kitchen, private laundry facilities, TV with free cable TV, private balcony, air-conditioning, internet access, hair dryer, undercover secure parking, free use of hotel's pool and heated spa . Spacious 1 bedroom apartment which features, a fully self contained kitchen, combined lounge dining, full laundry facilities, private balcony over looking the magnificent Surfers Paradise beach, Foxtel & security parking for 1 car. Linen supplied weekly. Rates are for 2 guests. Maximum 3 guests. Spacious 1 bedroom apartment which features bedroom with 1 queen bed, fully self contained kitchen, combined lounge dining, full laundry facilities, private balcony over looking the magnificent Surfers Paradise beach, Foxtel & security parking for 1 car. Linen supplied weekly. Rates are for 2 guests. Maximum 2 guests. Comfortable and spacious 1 bedroom with open plan Lounge, Dining room & kitchen, comprising either 1 Queen bed or 2 Single beds in the bedroom (please specify your preference when booking),a fully equipped kitchen including microwave oven, fridge/freezer, dishwasher, wall oven and grill, a large private bathroom with bath, full laundry facilities with washing machine and dryer, lounge area with colour TV, cable TV, large private balcony,ironing equipment and wireless internet access. Rate is for 2 guests. Maximum 2 guests. Children under 3 are free if using existing bedding. Porta-cots & high chairs are available at $8 per night each. Self Contained One Bedroom Apartment including full kitchen facilities, separate lounge & dining areas, separate bedroom, air-conditioning, TV, phone, hair dryer, safe deposit box and a private balcony. The Queen/Twin One Bedroom Apartment is a spacious non smoking and fully self contained apartment - guests need only provide foodstuffs and personal effects. The apartment is tastefully decorated, providing all the inclusions of a home away from home, featuring an in-room, corner SPA BATH, a large curved balcony (most with panoramic Gold Coast/sea views) and Jimojo Wireless Internet access. The apartment further includes either 1 Queen Bed or 2 Single beds (please specify preference in the Special Requests Section of your Booking), private modern bathroom with spa bath and shower, a fully equipped kitchen with full size fridge, microwave oven, wall oven and cook top, all appliances, crockery, utensils and glassware, separate dining and lounge area, colour TV, FREE cable TV, STD/IDD telephone system, private laundry facilities with washing machine and clothes dryer, in-room heater, ceiling fans, radio, alarm clock and ironing equipment. The rate is for 2 guests. Maximum occupancy is 3 guests. Extra guest charge is $30 per night. Ideal accommodation for couples or small families. Please note - SAME DAY BOOKINGS NOT ACCEPTED AFTER 1 P.M. The Queen/Twin One Bedroom Apartment is a spacious non smoking and fully self contained apartment - guests need only provide foodstuffs and personal effects. The apartment is tastefully decorated, providing all the inclusions of a home away from home, featuring an in-room, corner SPA BATH, a large curved balcony (most with panoramic Gold Coast/sea views) and Jimojo Wireless Internet access. The apartment further includes either 1 Queen Bed or 2 Single beds (please specify preference in the Special Requests Section of your Booking), private modern bathroom with spa bath and shower, a fully equipped kitchen with full size fridge, microwave oven, wall oven and cook top, all appliances, crockery, utensils and glassware, separate dining and lounge area, colour TV, FREE cable TV, STD/IDD telephone system, private laundry facilities with washing machine and clothes dryer, in-room heater, ceiling fans, radio, alarm clock and ironing equipment. The rate is for 2 guests. Maximum occupancy is 3 guests. Extra guest charge is $45 per night. Ideal accommodation for couples or small families. Please note - THE RATE INCLUDES FREE BREAKFAST AT THE RENDEZVOUS CAFE - a short 5 min walk away. Please further note - SAME DAY BOOKINGS NOT ACCEPTED AFTER 1 P.M. The luxury 1 Bedroom Apartment is a luxury, fully self contained apartment with contemporary finishes and furnishings, featuring a large, furnished entertaining balcony with views of either the beach, garden, pool, Surfers Paradise city or the country/hinterland, a seperate bedroom with 1 Queen Size Bed, a private bathroom with separate shower & bath, a fully equipped gourmet kitchen with Bosch appliances including dishwasher, full size refrigerator, freezer, oven, microwave oven, tea and coffee making facilities, full laundry facilities including a washing machine, clothes line/airer, iron/ironing board and clothes dryer, sair-conditioning (in living area and master bedroom), a seperate spacious lounge room, colour TV, 10 FREE channels of Austar cable TV, DVD player, CD player, direct internet access, security intercom, modem/data port connection, direct dial ISD/STD telephone, hairdryer, alarm clock, dial-up internet and all linen is provided. The rate is for 2 guests. Maximum occupancy is 3 guests. Extra guest charge is $50 per night. The luxury 1 Bedroom Plus Study Apartment is a luxury, fully self contained apartment with contemporary finishes and furnishings, featuring a large, furnished entertaining balcony with views of either the beach, garden, pool, Surfers Paradise city or the country/hinterland, a seperate bedroom with 1 Queen Size Bed, a seperate study with a large business desk, a private bathroom with separate shower & bath, a fully equipped gourmet kitchen with Bosch appliances including dishwasher, full size refrigerator, freezer, oven, microwave oven, tea and coffee making facilities, full laundry facilities including a washing machine, clothes line/airer, iron/ironing board and clothes dryer, sair-conditioning (in living area and master bedroom), a seperate spacious lounge room, colour TV, 10 FREE channels of Austar cable TV, DVD player, CD player, direct internet access, security intercom, modem/data port connection, direct dial ISD/STD telephone, a double sofa bed - extra guest charge applies, hairdryer, alarm clock, dial-up internet and all linen is provided. The rate is for 2 guests. Maximum occupancy is 3 guests. Extra guest charge is $50 per night. Rates are for 2 people.Bedding is Queen Bed in seperate bedroom.Double fold out sofa in lounge for extra guest at $20 per night. Maximum of 3 people. Laundry facilities.Some apartments are aircondtioned. (please request) Extra charge applies. Wireless Internet in all rooms and Foxtel in most apartments. Rates are for 2 people. Extra adults $20.00. Extra children $20.00. The room caters for a maximum of 3 adults, and a maximum of 2 children but cannot exceed 3 guests in total. The 1 Bedroom and Study Spa Apartment is an extremely spacious air conditioned and non smoking apartment featuring self contained, open plan living with a very spacious balcony and in room spa bath. The apartment further comprises 1 Queen Size Bed in the master bedroom, private bathroom with SPA bath and separate shower, reverse cycle air conditioning, Broadband internet access, fully self contained state of the art kitchen including a full size refrigerator and dishwasher, full private laundry facilities including washing machine, iron, ironing board and clothes dryer, colour TV, FREE Austar TV, CD player, DVD player, hairdryer, radio and tea/Coffee Making facilities. The seperate study also has a sofa bed which imay be used for extra guests ( extra guest charge applies). All linen etc is provided. Apartments are serviced weekly, however, for longer stays of 8 days and over a mid stay housekeeping service will be provided. The rate is for 2 guests. The maximum occupancy is 4 guests. Extra guest charge is $20 per guest per night. Cots are available at extra charge. Children under 2 years of age stay free if using existing bedding. 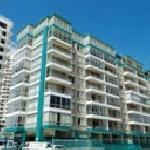 Quality 1 bedroom spacious apartment in Surfers Paradise that is fully equipped. All apartments have 1 bedroom with 1 Double Bed Or 2 Single Beds (please specify preference when booking), fully equipped kitchen, private laundry facilities, 1 bathroom, 1 toilet, balcony / courtyard, full kitchen, private laundry facilites, balcony / courtyard, ceiling fans, air-conditioning, cable TV, Wireless / WiFi and Broadband. Rates are for 2 guests. Max is 2 guests. The One Bedroom Apartment features floor to ceiling glass to fill the apartment with natural light and allow appreciation of the magnificent Hinterland views. The apartment is fully self contained and open plan further featuring specially commissioned finishes in glass, stone and stainless steel. This luxury SPA apartment comprises a spacious bedroom with 1 Double/Queen bed, a large, furnished private balcony with wonderrful hinterland views, a luxury private ensuite bathroom with in room spa bath and seperate shower, hairdryer and exclusive complimentary toiletries, climate controlled air conditioning and heating, full laundry facilities including washing machine and clothes dryer, a fully equipped gourmet kitchen with stone or vitrified slab bench tops and stainless steel appliances with gas cooktop, oven, microwave, refrigerator and dishwasher, continuous central hot water supply, spacious lounge room with quality furnishings and a seperate alcove with a double sofa bed, LCD television, cable television (Foxtel IQ), DVD player, CD/mini hi-fi system, alarm clock-radio, study area with direct-dial ISDN telephone and broadband internet access, iron and ironing board and key-card room access. Rate is for 3 guests. Maximum 4 guests. Extra guest charge $25 per night. Wake up to the sounds of the sea as this apartment is located on the 20th to 41st level and features direct ocean views!! The One Bedroom Spa Apartment features floor to ceiling glass to fill the apartment with natural light and allow appreciation of the magnificent ocean views. The apartment is fully self contained and open plan further featuring specially commissioned finishes in glass, stone and stainless steel. This luxury SPA apartment comprises a spacious bedroom with 1 Double/Queen bed, a large, furnished private balcony with wonderful ocean views, a luxury private ensuite bathroom with in room spa bath and seperate shower, hairdryers and exclusive complimentary toiletries, climate controlled air conditioning and heating, full laundry facilities including washing machine and clothes dryer, a fully equipped gourmet kitchen with stone or vitrified slab bench tops and stainless steel appliances with gas cooktop, oven, microwave, refrigerator and dishwasher, continuous central hot water supply, spacious lounge room with quality furnishings inc a seperate alcove with a double sofa bed, LCD television, cable television (Foxtel IQ), DVD player, CD/mini hi-fi system, alarm clock-radio, direct-dial ISDN telephone and broadband internet access, iron and ironing board and key-card room access. Rate is for 3 guests. Maximum 4 guests. Extra guest charge $25 per night. Our spacious 1-bedroom apartments have ocean views and a large lounge adjoining the balcony and a separate dining area. The apartment is well equipped with a modern kitchen and separate laundry. Secure underground parking, a BBQ and sparkling pool complete the facilities available for your enjoyment. 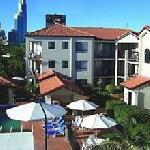 We are only 50 metres off the beach and are only a short stroll from the mall in Surfers Paradise. Buses depart from the door to anywhere on the Gold Coast including theme parks. We sell discounted tickets to the theme parks, and can organise all tours at no additional cost from our tour desk. Spacious 1 Bedroom apartment overlooking the resort tennis court and courtyard. The bedroom is studio style, sectioned off by sliding wooden doors. Also includes kitchenette, internal laundry, air con, tea/coffee, balcony. Rates are for 2 guests. Max. 3 guests. Extra guest charge applies. Cots available on request at extra charge. The Deluxe 1 bedroom apartment is perfect for those wanting a beautifully renovated apartment with all modern conveniences plus air conditioning. The apartment is fully self-contained with modern furnishings and appliances including 1 Double bed, luxurious private bathroom, fully equipped kitchen, including microwave, oven, toaster, etc, laundry, spacious lounge and dining area, air-conditioning, ceiling fans, colour TV, DVD player, ironing equipment and a large private balcony providing panoramic views. Rate is for 2 guests. Maximum 4 guests. Extra guest charge $25 per guest per night. Cots are available at an extra charge of $15 per night. The 1 bedroom standard apartment is perfect for those wanting a great deal - with fantastic views and perfect location. The apartment is fully self-contained with 1 Double bed, luxurious private bathroom, fully equipped kitchen, including microwave, oven, toaster, etc. and spacious lounge and dining area, ceiling fans, colour TV, ironing equipment and a large balcony providing panoramis views. Rate is for 2 guests. Maximum 4 guests. Extra guest charge $25 per guest per night. Cots are available at an extra charge of $15 per night. 1 bedroom apartment with a Queen bed, Sofa bed in the separate lounge area, private balcony / courtyard, ceiling fans, alarm clock, dial up internet access, full kitchen with dishwasher, hair dryer, ironing facilities, opening windows and refrigerator. Extra guests are $30 per night. Hi Surf Apartments have a private balcony, spacious living area, ensuite bathroom facilities, well-equipped kitchen with wall oven, hot plate, rangehood, dishwasher, microwave & fridge/freezer, washing machine & dryer, remote control TV with Foxtel cable TV, telephone, iron & ironing board, hair dryer & a clock radio. The spacious fully self contained and air conditioned one bedroom apartment is located between levels 2 and 11. The apartment is open plan comprising 1 Queen bed in the bedroom, a private ensuite bathroom, a spacious private balcony, a seperate large entertainment area with fully equipped gourmet kitchen, colour TV, cable television, pay-per-view movies, DVD player, stereo, fully equipped laundry with washing machine and dryer, hairdryer, radio, telephone and alarm clock. Rate is for 3 guests. Maximum occupancy is 4 guests. Extra guest charge $25 per guest per night. Children up to 2 stay free in existing bedding.